Antwerp’s potential was recognized by Napoleon Bonaparte and he ordered the construction of Antwerp’s first lock and dock in 1811. Called the Bonaparte Dock, it was joined by a second dock – called the Willem Dock after the Dutch King – in 1813. When the Belgian revolution broke out in 1830, there was a well-founded fear that the Dutch would blockade the Scheldt again but, in the event, they contented themselves with levying a stiff toll. Fortunately, the young Belgium had friends in Britain and particularly in the person of Lord Palmerston, who believed the existence of Belgium would be beneficial to Britain, and that, in consequence, it was important to make sure that the newly born state was economically viable. With his support, the Belgian government was able to redeem the Dutch Toll in 1863. By that time, the Kattendijk Dock had been completed in 1860 and the all important Iron Rhine Railway to the Ruhr had been finished in 1879. Antwerp then experienced a second golden age and by 1908 eight docks had been constructed. The opening of the Royers Lock, commenced in 1905, meant that ships drawing up to 31 feet (9.4 m) of water were able to enter the existing docks and access the new Lefèbvre and America docks. Such was the situation at the outbreak of the First World War (1914–1918). 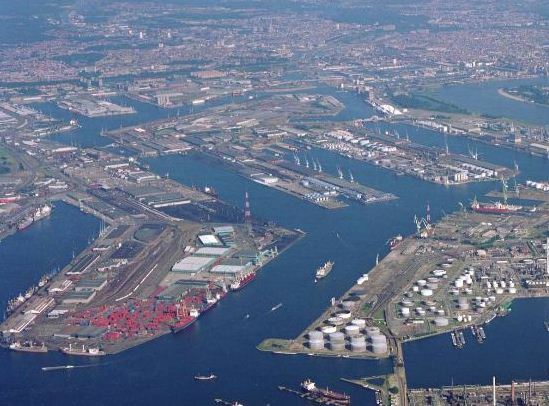 The British, and Winston Churchill, then First Lord of the Admiralty, in particular were well aware of the Port of Antwerp’s strategic importance, so much so that Churchill arrived in Antwerp on 4 October 1914 to take charge of the defence of the city and its port. Allied forces liberated Antwerp on 4 September 1944. The port and facilities were relatively undamaged and no major reconstruction work was required. However, Walcheren was the key that allowed use of the port, located further upstream on the right bank of the southern estuary of the river. Walcheren was attacked by Canadian and British forces and on 8 November all German resistance on the island had been overrun. An agreement assigned a large portion of the northern section of the port to the Americans and the southern section and the city of Antwerp to the British forces. The first US cargo vessel James B. Weaver arrived on 28 November 1944 with men of the 268th Port Company and their equipment on board. By mid-December the port was operating in high gear and, on average, some 9,000 civilians were employed by the Americans. Despite enemy air attacks, rockets and buzz bombs, operations were never entirely halted, although they were interrupted. In the first half year of 1945, the average amount of cargo discharged was around 0.5 million tons per month. After the close of the hostilities in Europe, the port was used for shipments of ammunition, vehicles, tanks and personnel to the Pacific. After the capitulation of Japan, shipments were directed to the United States. As from November 1945 the activities declined and by October 1946 all US Army operations ceased. Heel mooi artikel. Proficiat. Nu zien of het gepubliceerd wordt.